Characters Taverna (web site, 1103 Davie Street, Vancouver, phone 604-685-9607) offers traditional Greek and Indian dishes with some creative fusion dishes as well. 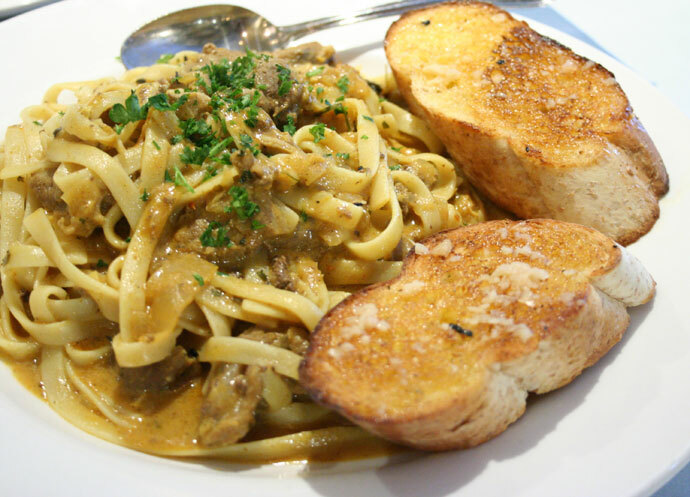 Below is a picture of my pasta special which was curry beef with fettucini (around $12). This is an unusual combination that actually worked really well. 14,392 views. This entry was posted on Tuesday, September 18th, 2007 at 7:41 pm	and is filed under Casual, Creative Dishes, Curry, Davie Street, Downtown, Food Photos, Greek, Indian, Lunch, Pasta, Restaurant, Take Out, Vancouver, Vancouver Restaurants. You can follow any responses to this entry through the RSS 2.0 feed. You can leave a response, or trackback from your own site. No problem Jimmy, I updated the link. If you need any food photography done for your site, feel free to contact me.